This is my box fort. Yes, I really did go in and blur out every address label by hand. I take customer privacy quite seriously. This is the nice man who brought me a cold coffee-type beverage at Dragon*Con 2007. I believe his name was Jeremy, but don't quote me on that. Also, Travis accused me of having happy grateful anime eyes for like an hour after this man rescued me from my caffeine withdrawal. He brought us these to sign. They are homemade copies of Exploitation Now, complete with every sketch and filler, that he made before the first compilation book came out. They are terrible awesome. This is Poe's close encounter with a certain tentacled... person. These are two diehard Exploitation Now fangirls, who insisted on giving us close tentacle encounters of a different sort altogether at Otakon 2007. They were like, fourteen, by the way. Yes, that IS a tenth doctor cross stitch. It's really creepy how his eyes follow you around the room. Really, REALLY creepy! As it is totally my duty to embarrass my baby sister most terribly, here is a picture of her in her halloween costume (she dressed as Arachne so that she wouldn't have to put down her knitting all night). In his role as a, well, Viking, Viking-Sensei felt it was his duty to abduct one of our women. So, now I've shared photos, and you all know what I look like. Let's have the photo sharing of what you all look like, too! And here's me with a standard-issue WIC staff rifle I bought at a heafty price through one of my many off-world contacts... Oh, ok, it's not the real thing, it's a replica I built myself; an artifact from the Universe in my head. Thought I'd ressurrect this thread and post some pics of my ugly mug, because we all know the forums need to be defaced eventually. Now for some not so normal pics. 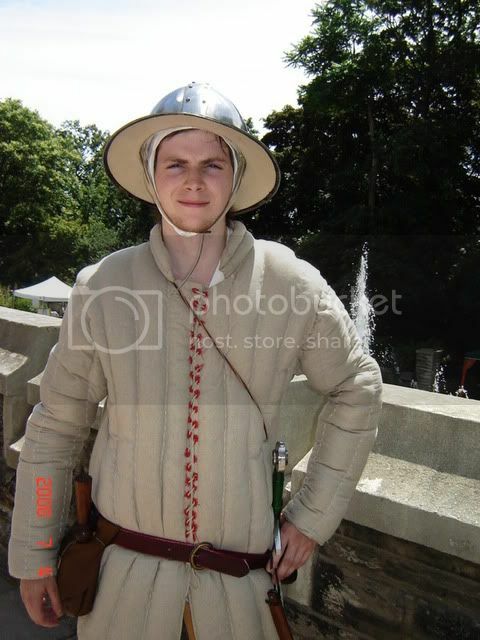 As you can see, I have a thing for dressing in historical clothing. Also, is that last picture Italy-inspired? The headgear reminds me strongly of an Italian painting, though it was from later than the 14th century, I think. Not SCA. 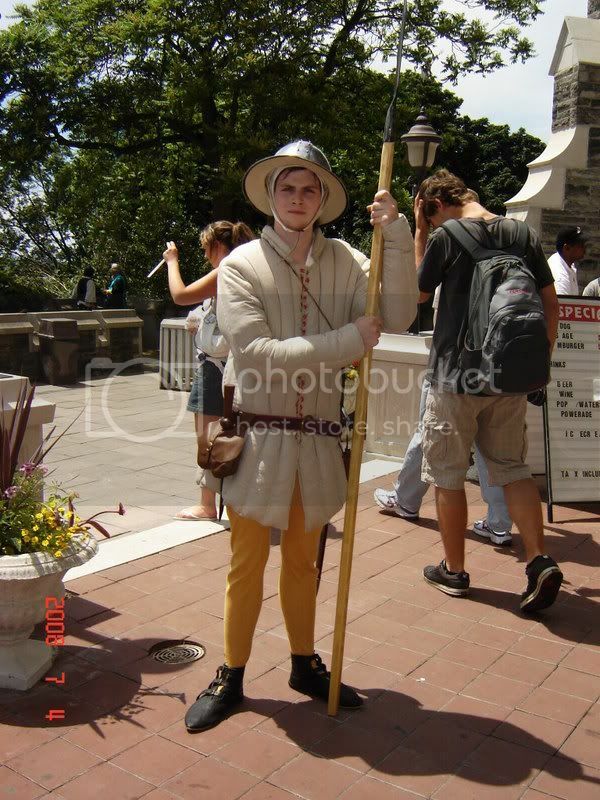 Living history/ reenactment. I have no beef with the SCA types, I just like accuracy a bit more. At present, I'm attempting to assemble a 10th century Norse kit for a Viking group that I'm joining. That hat is actually a hood. You can wear it as such, or roll the face opening up and stick it on your head to make a floppy hat. The style of hood with the extremely long tail (liripipe) goes back to the mid-14th century. The concept of rolling it into a hat only seems to have appeared at the very end of the 14th century, and extends well into the 15th. Though the style is not limited to Italy (you can see it everywhere in period artwork), they seemed to have a penchant for being ahead of the times when it came to fashion, so it's probable that such a hat would have shown up there before anyone else got a hold of it.